Welcome to the Artistic Outpost Design Team October Blog Hop! 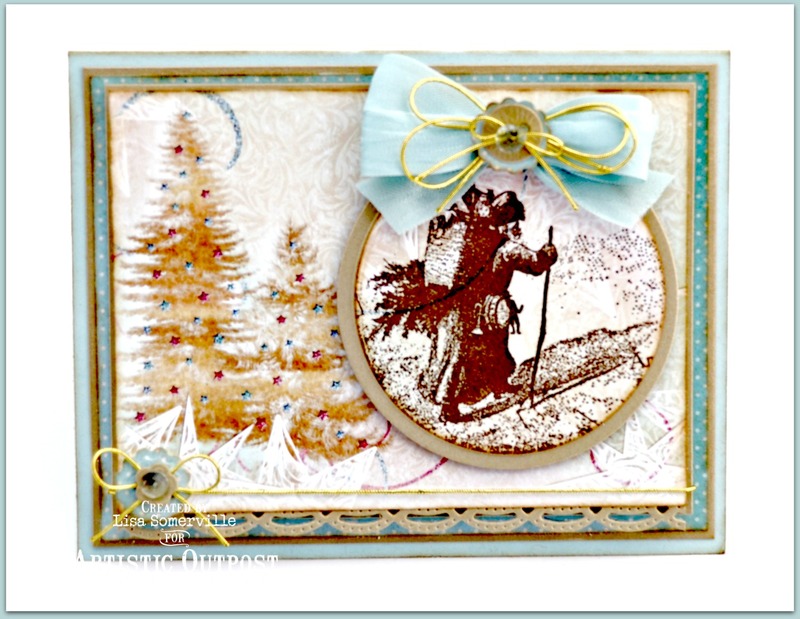 Each month, the fabulous designers at Artistic Outpost showcase projects created with various Artistic Outpost stamp sets/themes, this month the DT Blog Hop theme is Winter or Christmas. To create my card I used a stamp from the Snowy Woods stamp set along with Our Daily Bread Designs Custom Dies and pattern paper from the Christmas Paper Collection 2014. This is one of my favorite Christmas sets from Artistic Outpost, there are three wonderful vintage Santa's, a beautiful Christmas Door, old-fashioned sleigh, presents you can stack on the sleigh, snowflakes and some wonderful Christmas sentiments! I've made many of my Christmas cards with this set! I only wanted the Santa on the circle, so I used a SAMJ to stamp the image in Ranger Coffee Archival on a scrap of the pattern paper, then die cut the panel using the Circle Ornaments Die. I layered my stamped image on a Gold panel that was die cut using the Matting Circles Dies. To embellish I added a Seam Binding Bow, Gold Cord, Paper Buttons and Dew Drops. The buttons were cut from the pattern paper and Gold card stock using the button dies from the Matting Circle Dies and the berries from the Peaceful Poinsettias Die. Lisa, Oh how you make me wish I had these gorgeous stamps. The background with the trees so nicely decorated look wonderful and love how you have that vintage Santa hanging like an ornament! Love this! Enjoy! I really love this layout- and love this set from A.O...... I am so not ready to stamp Christmas themed cards yet, but because it makes me think of Coooollllddddddd weather! Love the bling you added on the trees. Lovely details! Santa is great stamped in the coffee ink and set in the circle. The trees and soft color scheme is beautiful! So many things in your background to look at...I love it!